We analyze various regulatory regimes for electricity transmission investment in the context of a power system transformation toward renewable energy. Distinctive developments of the generation mix are studied, assuming that a shift toward renewables may have temporary or permanent impacts on network congestion. We specifically analyze the relative performance of a combined merchant-regulatory price-cap mechanism, a cost-based rule, and a non-regulated approach in dynamic generation settings. We find that incentive regulation may perform better than cost-based regulation but only when appropriate weights are used. While quasi-ideal weights generally restore the beneficial properties that incentive regulatory mechanisms are well-known for, pure Laspeyres weights may either lead to over-investment or delayed investments as compared to the welfare-optimum benchmark. Laspeyres-Paasche weights, in turn, seem appropriate under permanently or temporarily increased network congestion. Thus, our analysis provides motivation for further research in order to characterize optimal regulation for transmission expansion in the context of renewable integration. 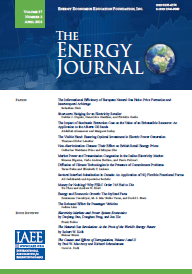 Proceedings - Optimal design for hourly electricity price in the Italian Market. Preliminary results.